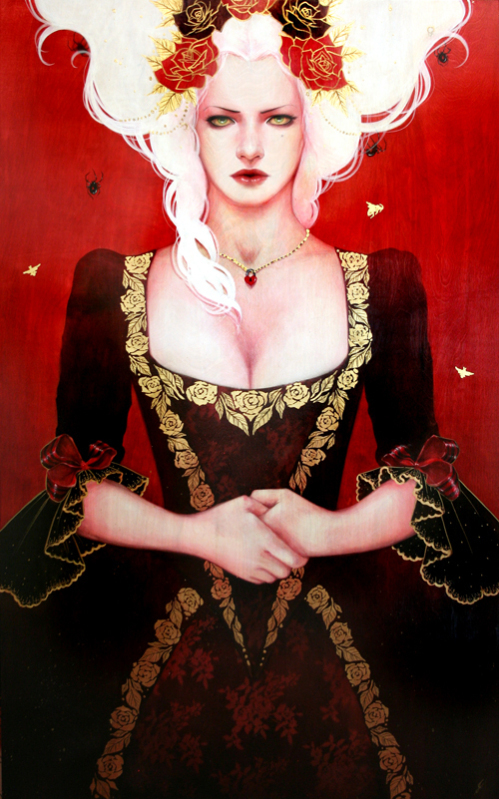 Sylvia Ji is revealing a new set of works at Corey Helford Gallery this Saturday, April 11th. Her hypnotic new show entitled “Haute Epoch” (Elegant Time) shows just what the enchantress can do with a brush. Back are her captivating Dia de los Muertos facades, along with some elegant Baroque detailings to compliment her seductive subjects. Even as Sylvia is busy getting ready for the show, she made some time for an insightful interview for the readers of AM. Check out the interview and a little preview of this stunning show after the jump. Arrested Motion (AM): Many artists grew up in families that were not art influenced. We heard that your father painted and your mom kept sketch books. How do you think that influenced your decision to get into the arts? Sylvia Ji (SJ): Both of my parents are highly creative and yet they never sought out to make a career of it as raising a family and making ends meet took precedence. Over the years, I saw in my dad the tortured artist, unable to create without timeÂ or freedom. I thank them eternally for allowing me to follow my dreams. AM: Since your 2007 show with White Walls, you’ve painted many of your subjects with the Dia De Los MuertosÂ (Day of the Dead) theme. What is your fascination with this Mexican holiday and what led you to incorporate this theme into your repertoire? 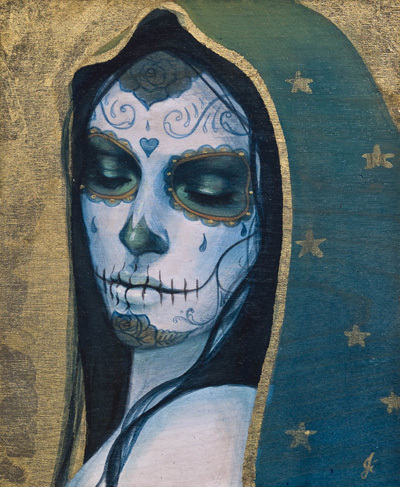 SJ: I’ve always been drawn to the dark, macabre side of life, always trying to incorporate elements/idea of “memento mori” which in Latin means “be mindful of death.” The iconic image of “La Catrina” created by Jose Posada has been around for nearly a century. 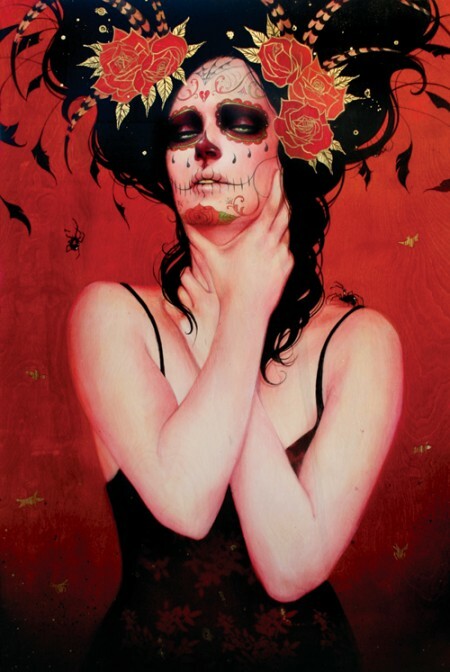 Through research I was introduced again to that image and was instantly drawn into the idea of death as a woman and how beauty and life is fleeting. AM: We’ve heard that a few celebrities collect your work. How do you feel about your work being in such esteemed collections? SJ: I’m just glad that people collect my work! I think it’s great that they love a piece enough to buy and hang it on their wall. AM: Coming out of school in San Francisco, you’ve shown mainly on the West Coast with tremendous success. How do you feel about branching out internationally for your show in November with StolenSpace? SJ: I’m extremely excited to be able to show in London! It’s a great opportunity and hopefully will enable me to show further overseas. AM: Are there other shows you have planned after November? What other countries would you like to show in? SJ: I have a group show at Joshua Liner in New York this year and a solo there next year in June 2010. I’d love to show in Paris, Tokyo, Australia, anywhere that will enable me to travel and paint. AM: Thanks Sylvia for taking the time to catch up with us. 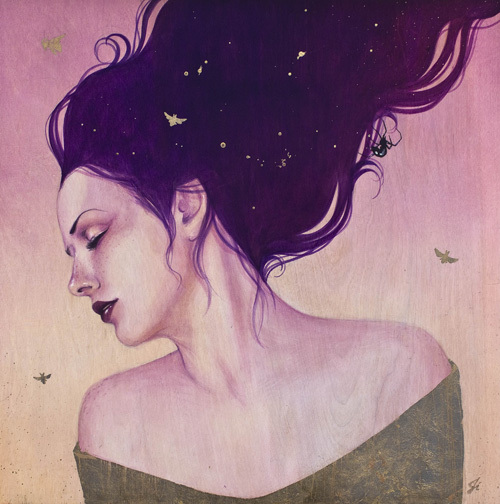 We look forward to attending your opening this Saturday at Corey Helford. We also encourage anyone in the Los Angeles area to stop by to experience Sylvia’s works in person. Categories: Art, Interviews, Low Brow & Pop Surrealism, Previews, Shows & Events. 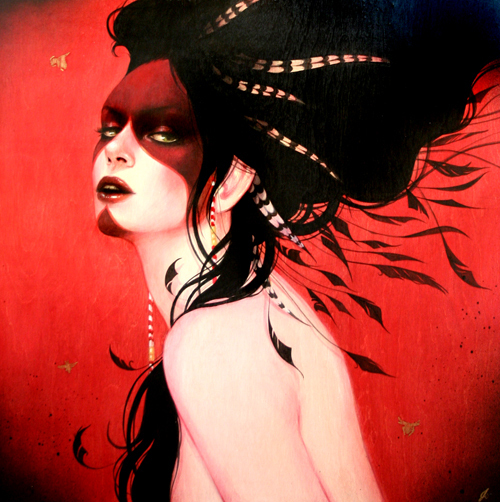 Tags: Corey Helford Gallery, Interviews, Low Brow & Pop Surrealism, Previews, Shows & Events, Sylvia Ji, Sylvia Ji - CH - 09.